THE CITIZEN ROSEBUD: #SECONDHANDFIRST™: Cool. The smug look on my face is probably from the fact I was feeling super smart and clever in my 100% SECONDHANDFIRST outfit. I can't say that it was ALL "thrifted," because it wasn't. It's EVEN better. STOP. Hear me out. The shirt and the shorts were freebies, cast offs by their previous owners, and picked up by me. A floral polyester shirt isn't for the weak of heart, it's a kind of meshy, thin late 1970s polyester, not exactly screaming "lux." And, the vintage "mom" jeans were abandoned for good reason. #SECONDHANDFIRST Shortcuts: when "mom jeans" go good. People who truly love themselves should NOT be prancerizing about in bonafide mom jeans. I had taken about 4 pair from a freebie pile about 4 years back, and converted them into "mom shorts" and voila, insta-streetstyle cred.You can see them in their original state in from a 2010 outfit post HERE. 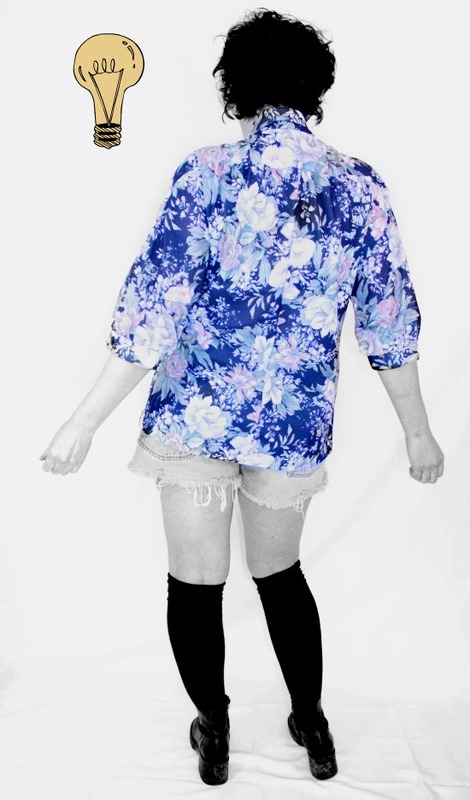 And a few other posts featuring the mom shorts can be peeped at HERE, HERE, HERE. Most recently (and quite flatteringly) rocked HERE. I guess what I'm trying to share (along with my puzzling fondness for running around in mom shorts) is that to shop #SECONDHANDFIRST you don't need to SHOP. At all. As in, you can SHOP YOUR CLOSET. Or check out a free pile. Or accept your neighbor's hand-me-downs. 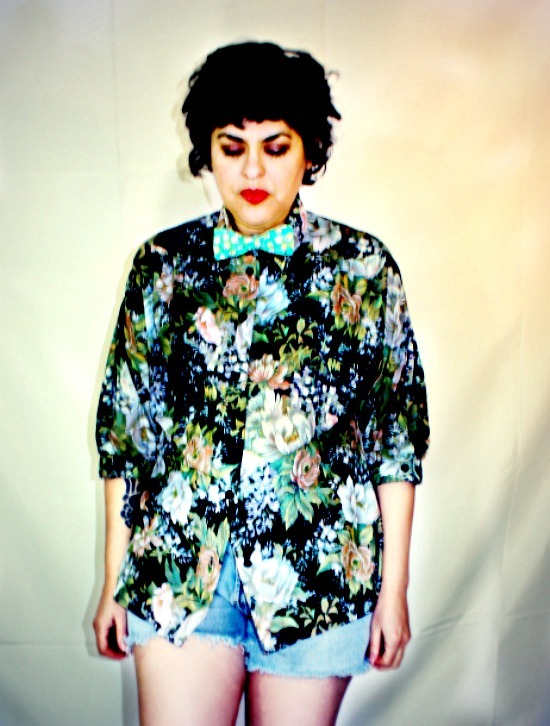 Which in this case, is that fabulously floral vintage polyester blouse of geekdom. I mean cool-dom. Ala Geeky-so-Chic-y. Which brings me to the bow-tie. Because, what amps up this 100% SECONDHANDFIRST ensemble from a 10, TO AN ELEVEN is the killer, kilowatt bow-tie. 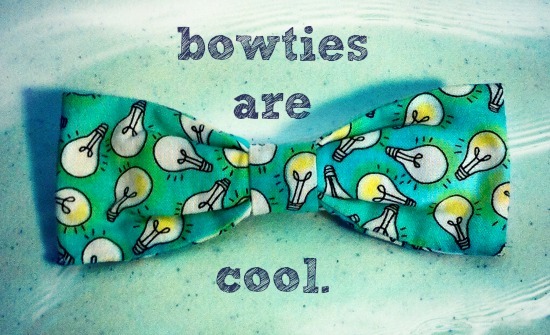 My bow-tie has freakin' LIGHTBULBS on them. Brilliant, yeah? What can better highlight my point, (high-LIGHT, eh, eh, get it?) 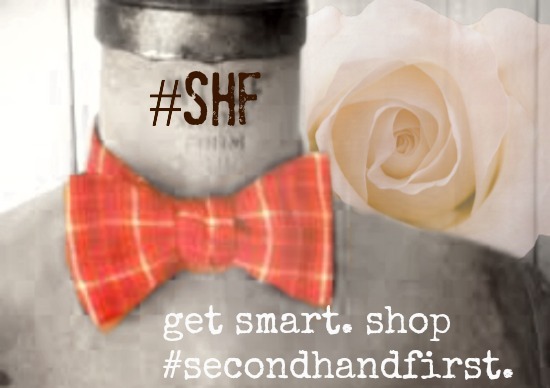 about how smart you are when you pledge to shop #SECONDHANDFIRST than a goofy vintage 1980s novelty print bow tie with lightbulbs on it? Don't bother answering- rhetorical question. Top to bottom, the whole outfit cost me under $30 bucks. Bow-tie and boots were thrifted; the boots were a secondhand splurge from the Goodwill- they were a whopping $20 plus tax. They are vintage 1990s Nine West ankle boots with a big rubber heel and bottom so I can literally walk miles in them, feeling comfy and sassy. Which at this time in my life, has become VERY important. The bow-tie is for sale: YOU can wear it to your 1980s themed prom. Or your next Evolution vs Creationism debate. Or as a tongue-in-cheek homage to the eleventh doctor. Because bow-ties ARE cool. And, do you know who's also cool? Sara, from Hello the Mushroom blog. She's cool. And her recent post about taking the #SECONDHANDFIRST pledge is HELLA cool. So cool, in fact, I INSIST you check it out. Which you can do so by clicking here. I'll wait. You back? It's pretty cool, right? In fact, you might call it BACK-TO-BACK coolness. Ah, I'm such a funny paper. Well, in all seriousness, what REALLY is going to be cool is next Friday's post, BECAUSE it's our #SECONDHANDFIRST monthly link up! That's where YOU come in. You'll add a link of wonderful you rocking a secondhand find. It could be something from your own closet, from a swap, free pile or a hand-me-down. It could be a score from a yard sale, a charity bazaar, a bargain picked up at a car boot sale, a thrift consignment or vintage shop. It doesn't matter WHAT it is, just as long as it's something that shows YOUR commitment to making stylish + sustainable shopping choices. Because, when it comes down to it, that's the coolest thing of all. Bella, you are Super Cool! Love that top picture, one of your best, I think. I love mom jeans... I'm so long waisted they look like regular jeans. U look cute n them! You rock! 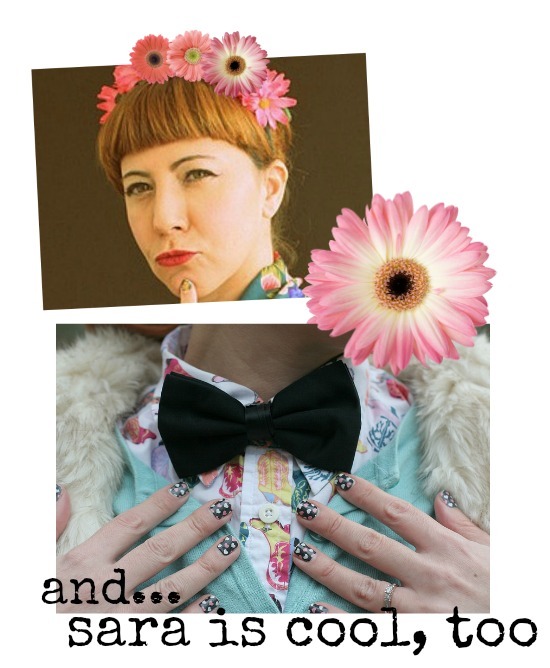 I love the bow tie, and I especially love your hair and makeup in this post! Hell, yeah. This is an incredible look and I almost wish I could pull it off! I do love your eye makeup look .. what ever you have on your lids is outstanding color! Hey Bella! Loving the way you turned those mom jeans around... they actually look cool now! yes, bow ties are way cool. Ah, thank you for clarifying what you meant by "shopping" secondhand. If you mean getting things from freebie piles, then that widens the scope considerably. I can take the pledge! I'm trying very hard not to spend any money on clothing right now. Electronic gadgets, on the other hand, I've run riot. The art project road trip required it. That lightbulb tie is so damn cute. May I claim it? I think Severo would look super illuminating with it! My ETA for Seattle is 5/20. You make Mom jeans fabulous!!! I'm always game for someone else's castoffs. I was raised wearing handmedowns.